Displayed here is a selection of antique and vintage postcards of scenes in Mercer County, New Jersey. Most of these postcards were accumulated by my family who resided in or near these towns. The actual text printed on the postcards is in quotation marks. 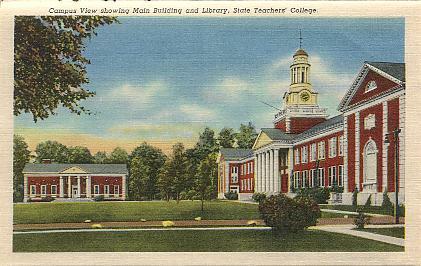 Click on the image to see a larger view of the postcard. 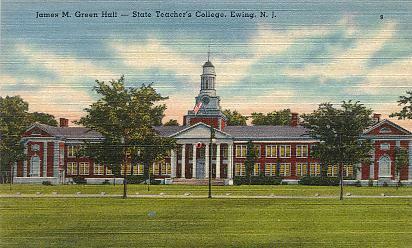 "James M. Green Hall, State Teacher's College, Ewing, N. J.". Color linen-texture printed postcard. Published by Siegle Brothers, Inc., Trenton, N. J. Printed by Tichnor Bros., Inc., Boston, Mass. Number 69290. Unused. Probably circa late 1940s. "Campus view showing main building and library, State Teachers' College". Color linen-texture printed folder view. Published by Lynn H. Boyer, Jr., Wildwood, N. J. "C.T. Art-Colortone" printed by Curteich, Chicago. Number D-7121. Unused. Copyright 1943. "Greetings from Hightstown, N. J. Lovers' Lane - (Maxwelton Park)". Black & white printed postcard. Publisher not given. 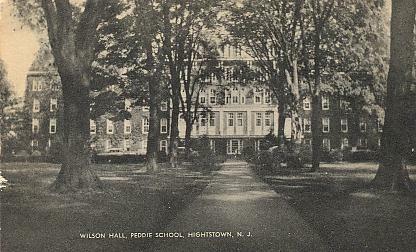 Postmarked 1905, Hightstown, N.J.
"Wilson Hall, Peddie School, Hightstown, N. J.". Black & white printed postcard. Published by the Mayrose Co., Linden, N. J. Unused. Probably circa 1930s. 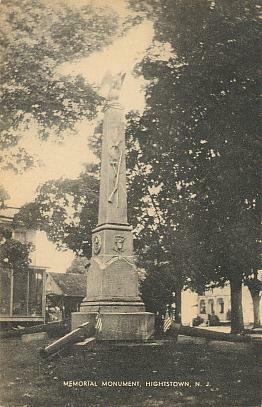 "Memorial Monument, Hightstown, N. J.". Black & white printed postcard. Published by the Mayrose Co., Linden, N. J. Unused. Probably circa 1930s. "Presbyterian Church, Pennington, N. J.". Black & white printed postcard. Published by Geo W. Scarborough, Ph. 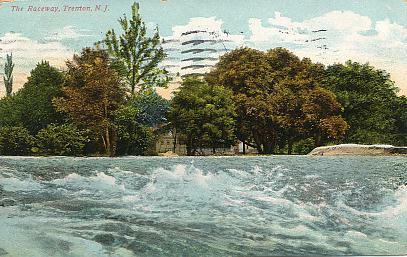 G., Pennington, N. J. 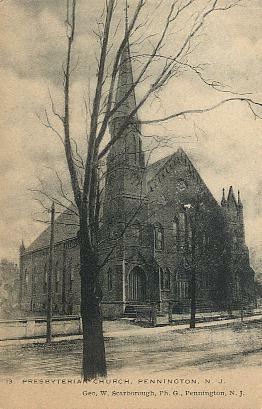 Printed by E. Moebius, Phototype, Camden, N. J. Number 13. Postmarked 1908. 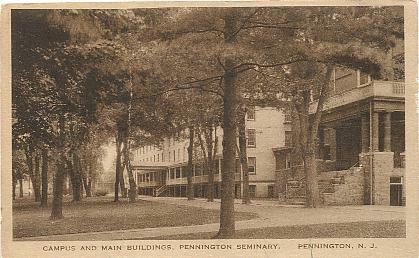 "Campus and Main Buildings, Pennington Seminary, Pennington, N. J.". 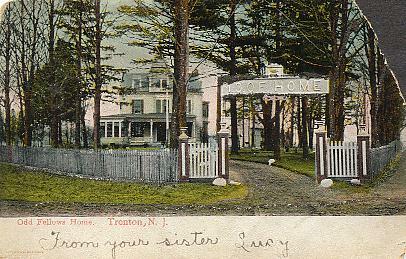 Sepia colored printed postcard. Printed by the Albertype Co., Brooklyn, N. Y. Unused. Probably circa 1910s. "Museum of Historic Art. 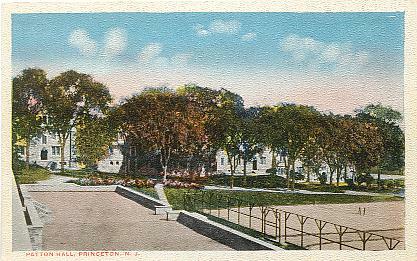 Princeton, N. J.". Black & white printed postcard, with undivided back. Published by the American News Company, New York. Number A1483. Unused. Probably circa 1906. 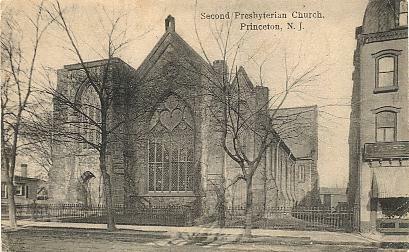 "Second Presbyterian Church, Princeton, N. J.". Black & white printed postcard. Published by W. C. Sinclair, Princeton, N. J. Number F 293. 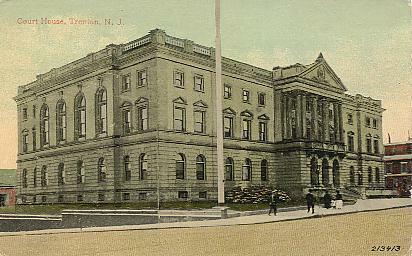 Postmarked 1913. 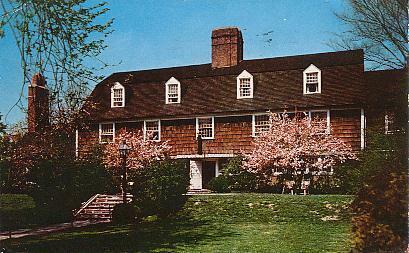 "Nassau Tavern Hotel. 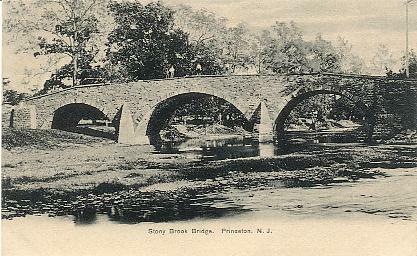 Princeton, N. J. ...". Color chrome-style printed postcard. Published by Curteich. Postmarked 1955. "Residence of C. F. W. McClure, Princeton, New Jersey". Black & white printed postcard. Published by the Albertype Co., Brooklyn, N. Y. Postmarked 1924. "Morven. Princeton, Mercer County, New Jersey. ...". Color chrome-style printed postcard. Published by the Scheller Co., Hackettstown, N. J. Printed by K. Number 66585. Copyright 1963. Postmarked 1969. 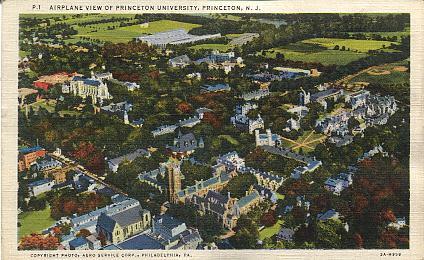 "Airplane view of Princeton University, Princeton, N. J.". Color linen-texture printed postcard. Published by Lynn H. Boyer, Wildwood, N. J. "C.T. Art-Colortone" printed by Curt Teich & Co., Chicago. Number 3A-H958. Number P-1. Unused. Published 1933. 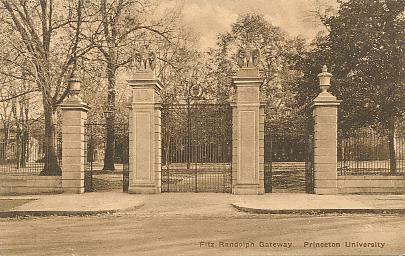 "Fitz Randolph Gateway, Princeton University". Sepia color printed postcard. 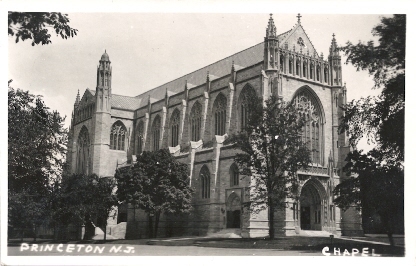 Published by Princeton University Store, Princeton, N. J. Printed by the Albertype Co., Brooklyn, N. Y. Unused. Probably circa 1910s. 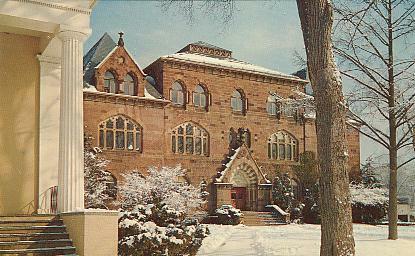 "Stafford Little Hall, Princeton Univ. 1899". Color printed postcard. Published by Van Marter. Number 868/11. 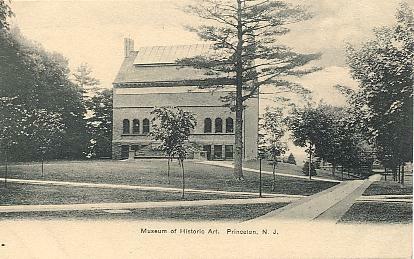 Postmarked 1913, Princeton, N. J. 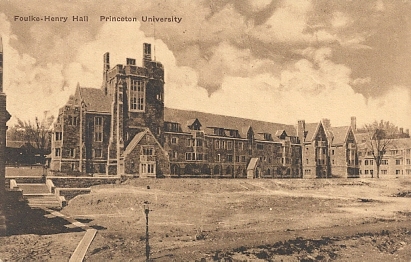 "Brokaw Hall, Princeton University, Princeton, N. J.". Black & white printed postcard, with undivided back. Published by the Rotograph Co., N. Y. City. Number A18332. Unused. Probably circa 1906. 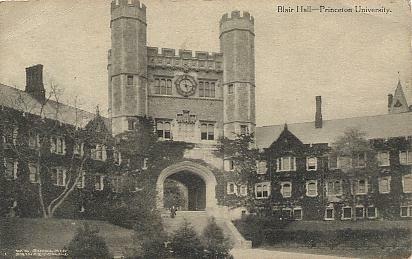 "Blair Hall -- Princeton University". Black & white printed postcard. 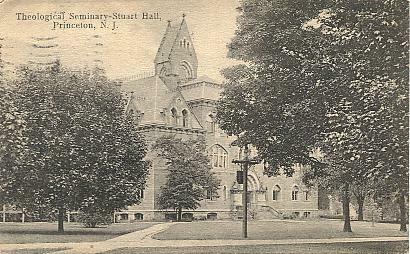 Published by W. C. Sinclair, Princeton, N. J. Postmarked 1913. 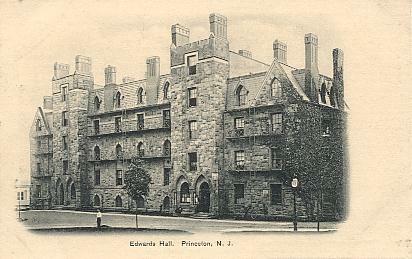 "Patton Hall, Princeton, N. J.". Color printed postcard. Publisher not given. Unused. Probably circa 1920s. 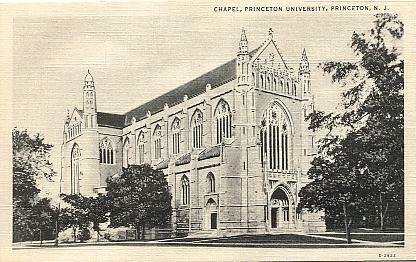 "Chapel, Princeton, N. J.". Real photo postcard. Publisher not given. Unused. Probably circa early 1930s. "Chapel, Princeton University, Princeton, N. J.". Black & white linen-texture printed postcard. Published by Curt Teich & Co., Chicago, Ill. Number D-2822. Unused. Probably circa late 1930s. 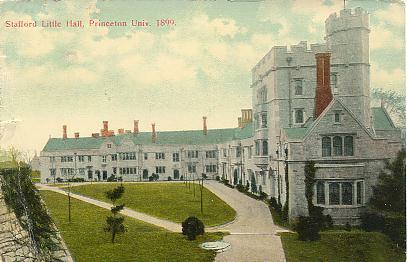 "Old Nassau Hall, Princeton University, New Jersey". Black & white printed postcard. Published by Conoco Touraide. Unused. 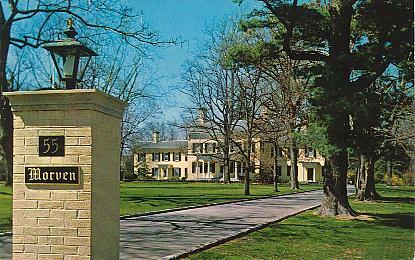 Circa 1946-50. 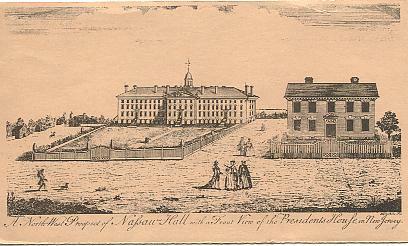 "Nassau Hall circa 1764, Princeton, N.J. Princeton Bicentennial 1776 - 1976". Sepia colored printed postcard. Published by the Princeton Chamber of Commerce. Postmarked 1975. 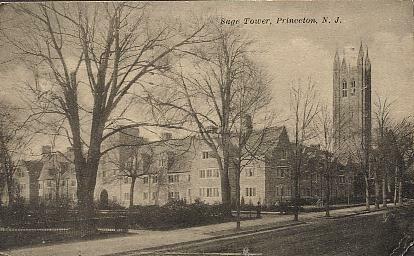 "Sage Tower, Princeton, N. J.". Black & white printed postcard. Published by the Princeton University Store, Princeton, N. J. Number F5082. 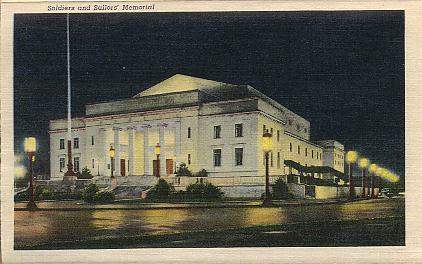 Postmarked 1915. 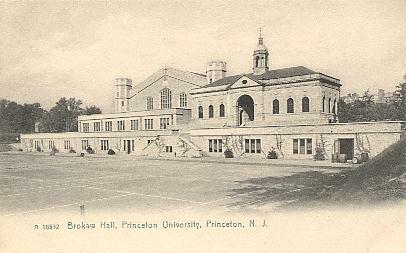 "Foulke-Henry Hall, Princeton University". Sepia color printed postcard. 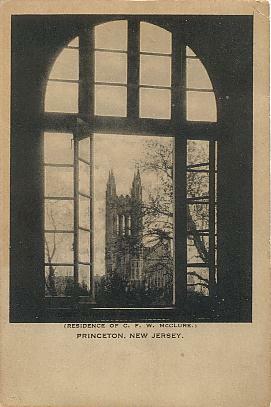 Published by Princeton University Store, Princeton, N. J. Printed by the Albertype Co., Brooklyn, N. Y. Unused. Probably circa 1910s. 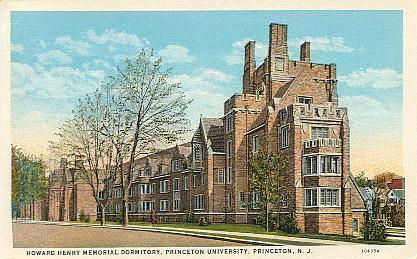 "Howard Henry Memorial Dormitory, Princeton University, Princeton, N. J.". Color printed postcard. Published by Robbins & Son, Pittsburgh, Pa. Printed by C. T., Chicago. Number 104354. Unused. Probably circa 1925. 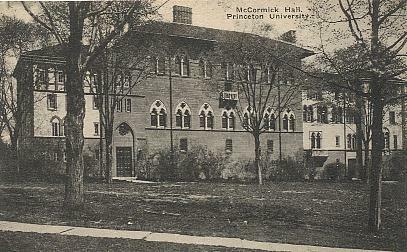 "McCormick Hall, Princeton University". Black & white printed postcard. Published by H. M. Hinkson, Princeton, N. J. Printed by the Albertype Co., Brooklyn, N. Y. Unused. Probably circa 1910s. 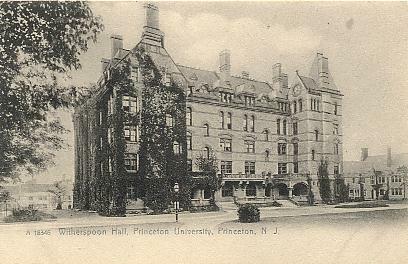 "Seventy-Nine Hall, Princeton, N. J.". Color printed postcard. Published by Christie Whiteman, Princeton, N. J. Unused. Probably circa 1920s. 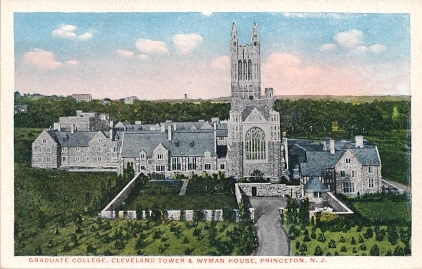 "Graduate College, Cleveland Tower & Wyman House, Princeton, N. J.". Color printed postcard. Published by Christie Whiteman, Princeton, N. J. Unused. Probably circa 1920s. "The Harvey S. Firestone Memorial Library, Princeton University. 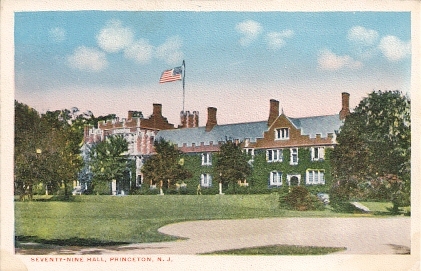 Princeton, N. J. ...". Color chrome-style printed postcard. Published by Lynn H. Boyer, Jr., Wildwood, N. J. Printed by Curteich. Postmarked 1968. 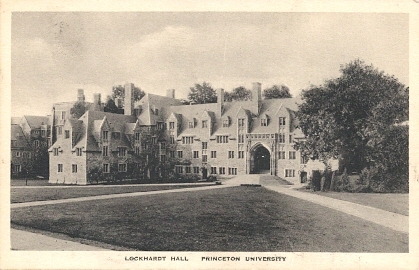 "Lockhardt Hall, Princeton University". Black & white printed postcard. Published by March & Co., Princeton, N. J. Printed by the Albertype Co., Brooklyn, N. Y. Unused. Probably circa 1910s. 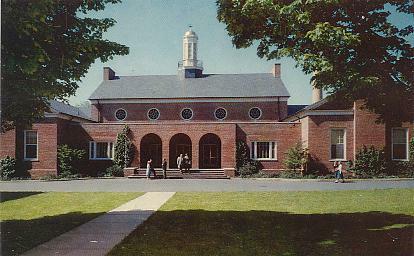 "Campus Center, Princeton Theological Seminary. Princeton, New Jersey. ...". Color chrome-style printed postcard. Published by Princeton Polychrome Press. Unused. Probably circa late 1950s. "Stuart Hall, Princeton Theological Seminary. Princeton, New Jersey. ...". Color chrome-style printed postcard. Published by Princeton Polychrome Press. Unused. Probably circa late 1950s. 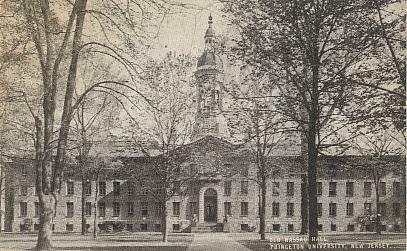 "Theological Seminary - Stuart Hall, Princeton, N. J.". Black & white printed postcard. 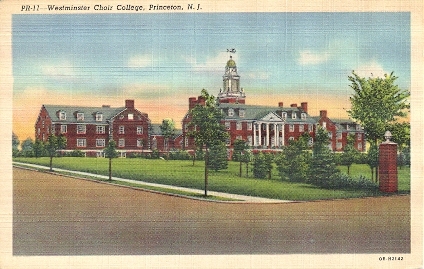 Published by Joseph Priest, Princeton, N. J. Postmarked 1914. "Westminster Choir College, Princeton, N. J.". Color linen-texture printed postcard. Published by Lynn H. Boyer, Wildwood, N. J. "C.T. Art-Colortone" printed by Curteich, Chicago. Number 0B-H2142. Number PR-11. Unused. Published 1940. 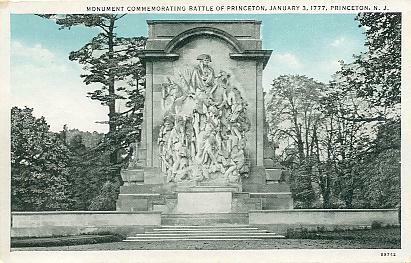 "Monument Commemorating Battle of Princeton, January 3, 1717, Princeton, N. J.". Color printed postcard. Published by Curt Teich & Co., Chicago, Ill. Number 89742. Unused. Probably circa 1922. 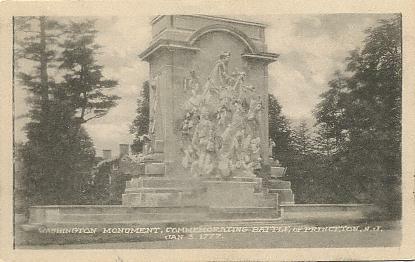 "Washington Monument, Commemorating Battle of Princeton, N. J.". Black & white printed postcard. Published by the Eagle Post Card Co., New York. Number 89742. Unused. Probably circa 1920s. 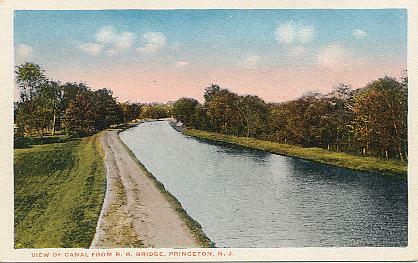 "View of canal from R. R. bridge, Princeton, N. J.". Color printed postcard. Published by Christie Whiteman, Princeton, N. J. Unused. Probably circa 1920s. "Wally Byam Caravan Club, 7th International Rally, Princeton, New Jersey, June 22 to July 5, 1964". Black & white chrome-style printed postcard. Published by Pontiac Motor Division. Unused. Probably circa 1964. 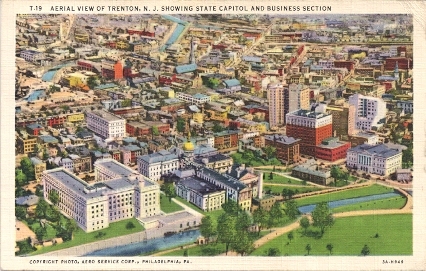 "Aerial view of Trenton, N. J. showing state capitol and business section". Color linen-texture printed postcard. Published by Lynn H. Boyer, Wildwood, N. J. "C.T. Art-Colortone" printed by Curt Teich & Co, Chicago. Number 3A-H949. Number T-19 Unused. Published 1933. Postmarked 1941. 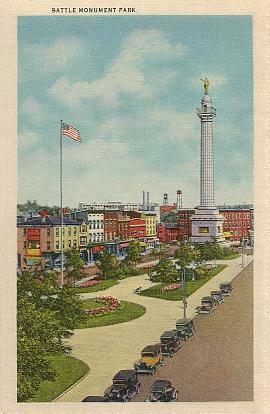 "Battle Park and Monument, Trenton, N. J.". Color linen-texture printed postcard. Published by Tichnor Bros. Number 69288. Postmarked 1947. 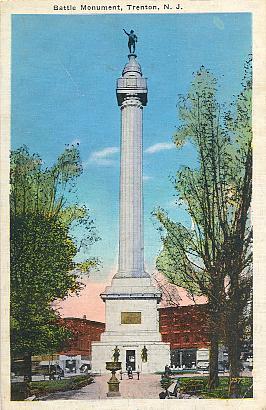 "Battle Monument, Trenton, N. J.". Color printed postcard. Published by Siegle Bros., Trenton, N. J. Number 7573. Postmarked 1937. 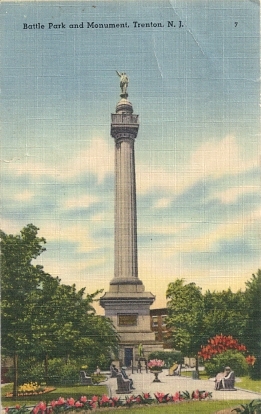 "Battle Monument Park". Color linen-texture printed folder view. Published by Lynn H. Boyer, Jr., Wildwood, N. J. "C.T. Art-Colortone" printed by Curteich, Chicago. Number D-7121. Unused. Copyright 1943. 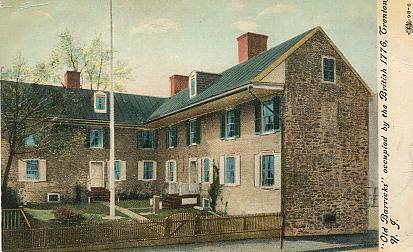 "'Old Barricks' occupied by the British 1776, Trenton, N. J.". Color printed postcard. Published by IPCN & Co. Number 98-6. Used but no postmark. Probably circa 1910. 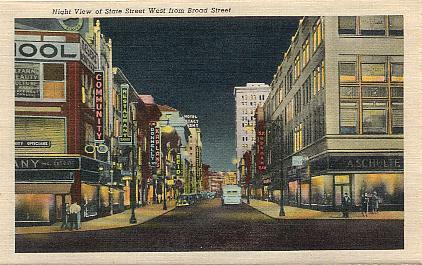 "Night view of State Street West from Broad Street". Color linen-texture printed folder view. Published by Lynn H. Boyer, Jr., Wildwood, N. J. "C.T. Art-Colortone" printed by Curteich, Chicago. Number D-7121. Unused. Copyright 1943. 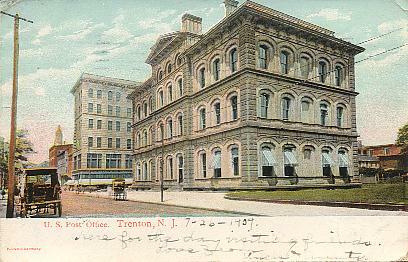 "Court House, Trenton, N. J.". Color printed postcard. Published by the Leighton & Valentine Co., N. Y. City. Number 213413. Unused. Probably circa 1910. 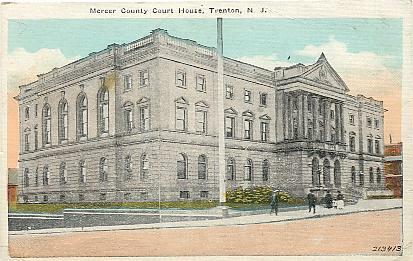 "Mercer County Court House, Trenton, N. J.". Color printed postcard. Published by Siegle Bros., Trenton, N. J. Number 213413. Unused. Probably circa 1920s. 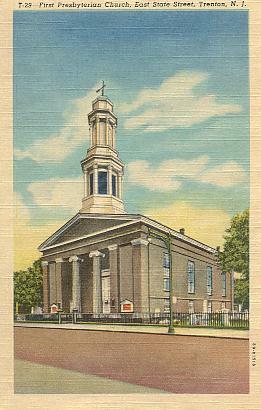 "First Presbyterian Church, East State Street, Trenton, N. J.". Color linen-texture printed postcard. Published by Lynn H. Boyer, Jr., Wildwood, N. J. "C.T. Art-Colortone" printed by Curteich, Chicago. Number T-29. Number 8B-H1518. Unused. Published 1948. 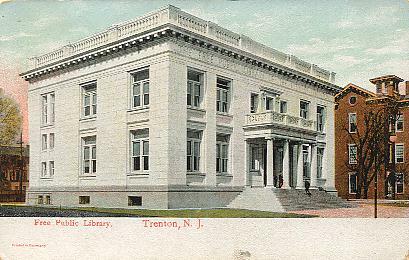 "Free Public Library, Trenton, N. J.". Color printed postcard; with undivided back. Publisher not given. Printed in Germany. Unused. Probably circa 1906. 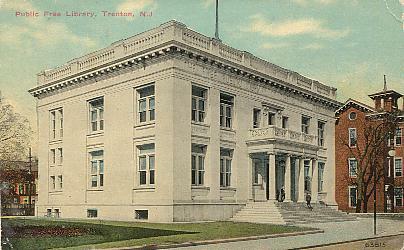 "Public Free Library, Trenton, N. J.". Color printed postcard. Publisher not given. Number 63813. Unused. Probably circa 1915. "N. J. 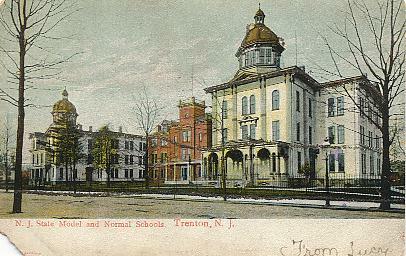 State Model and Normal Schools, Trenton, N. J.". Color printed postcard; with undivided back. Publisher not given. Printed in Germany. Postmarked 1906. 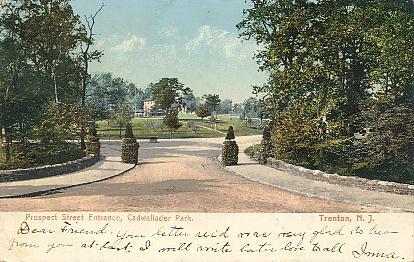 "Prospect Street entrance, Cadwallader Park, Trenton, N. J.". Color printed postcard; with undivided back. Published by the American News Company, New York. Number A6535. Published probably circa 1906. Postmarked 1909. 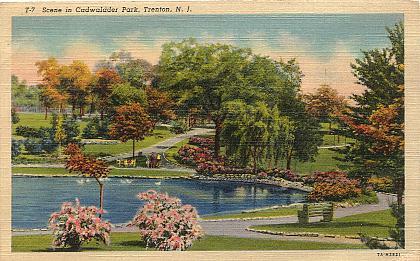 "Scene in Cadwalader Park, Trenton, N. J.". Color linen-texture printed postcard. Published by Lynn H. Boyer, Wildwood, N. J. "C.T. Art-Colortone" printed by Curt Teich & Co., Chicago. Number 7A-H2521. Number T-7. Published 1937. Postmarked 1939. 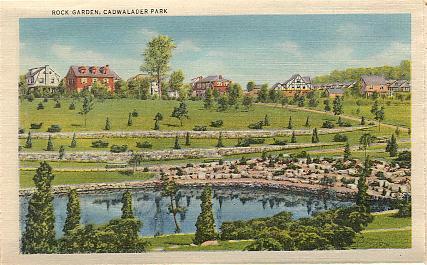 "Rock Garden, Cadwalader Park". Color linen-texture printed folder view. Published by Lynn H. Boyer, Jr., Wildwood, N. J. "C.T. Art-Colortone" printed by Curteich, Chicago. Number D-7121. Unused. Copyright 1943. "Odd Fellows Home, Trenton, N. J.". Color printed postcard; with undivided back. Publisher not given. Printed in Germany. Postmarked 1906. 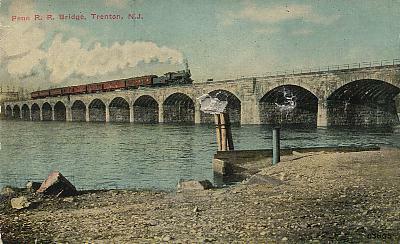 "Penn R. R. Bridge, Trenton, N. J.". Color printed postcard. Publisher not given. Number 63805. Unused. Probably circa 1915. 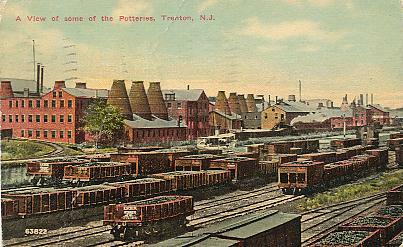 "A view of some of the Potteries, Trenton, N. J.". Color printed postcard. Publisher not given. Number 63822. 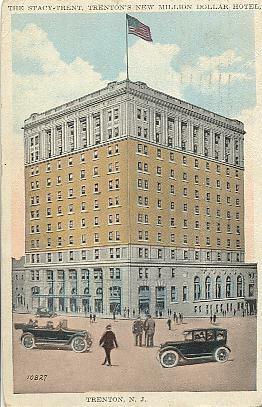 Postmarked 1915. 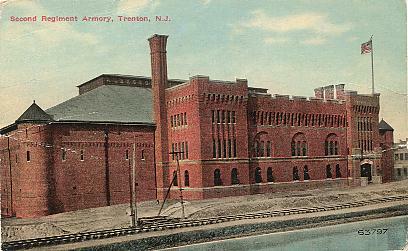 "Second Regiment Armory, Trenton, N. J.". Color printed postcard. Publisher not given. Number 63797. Unused. Probably circa 1915. "U. S. Post Office. Trenton, N. J.". Color printed postcard. Publisher not given. Printed in Germany. 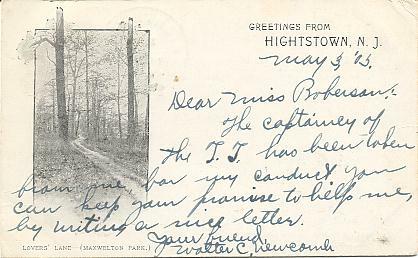 Postmarked 1909. 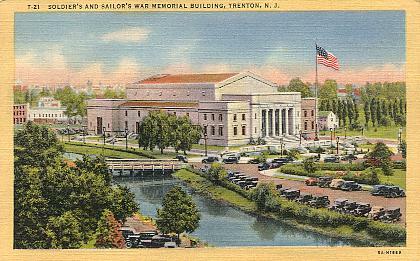 "Soldier's and Sailor's War Memorial Building, Trenton, N. J.". Color linen-texture printed postcard. Published by the Union News Co. and printed by Curteich, Chicago. Number T-21. Number 5A-H1669. Unused. Published 1935. "Soldiers and Sailor's Memorial". Color linen-texture printed folder view. Published by Lynn H. Boyer, Jr., Wildwood, N. J. "C.T. Art-Colortone" printed by Curteich, Chicago. Number D-7121. Unused. Copyright 1943. 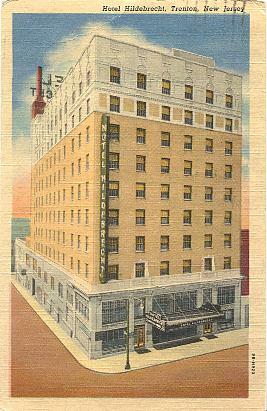 "Hotel Sterling, Trenton, N. J. Remodelled and Refurnished. Bath and Running Water and Telephones in Each Room. Sample Rooms.". Colored printed postcard. Published by Leo Meyer, Office 32 Pomp Bldg., Easton, PA. Number R-84683. Unused. Probably circa 1920s. 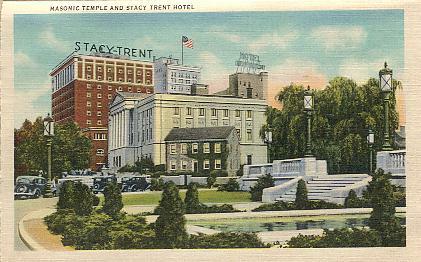 "The Stacy-Trent, Trenton's new million dollar hotel, Trenton, N. J.". Color printed postcard. Published by Siegle Bros., Trenton, N. J. Number 10827. Postmarked 1932. 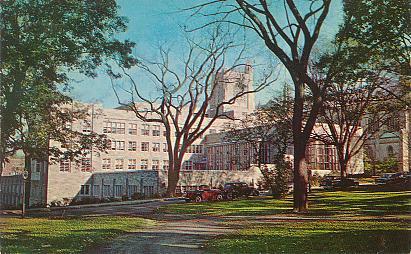 "St. Francis Hospital". Color linen-texture printed folder view. Published by Lynn H. Boyer, Jr., Wildwood, N. J. "C.T. Art-Colortone" printed by Curteich, Chicago. Number D-7121. Unused. Copyright 1943. 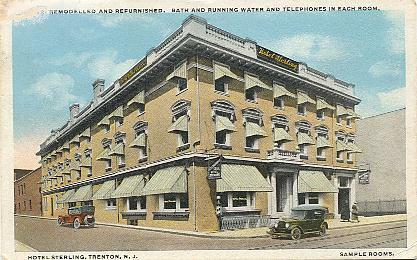 "Hotel Hildebrecht, Trenton, New Jersey". Color linen-texture printed postcard. Published by Hickey Brothers, Davenport, Iowa, and printed by Curteich, Chicago. Number 9B-H920. Published 1949. Postmarked 1950. 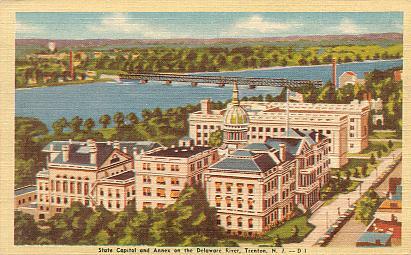 "State Capitol and Annex on the Delaware River, Trenton, N. J.". Color linen-texture printed postcard. Published by Harold Anshen & Co., Trenton, N. J. Printed by the Dexter Press, Pearl River, N. Y. Number D 1. Number 27899. Unused. Probably circa 1940s. 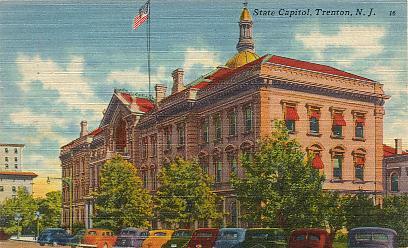 "State Capitol, Trenton, N. J.". Black & white printed postcard; with undivided back. Published by E. M. Watson. Number 10. Postmarked 1906. 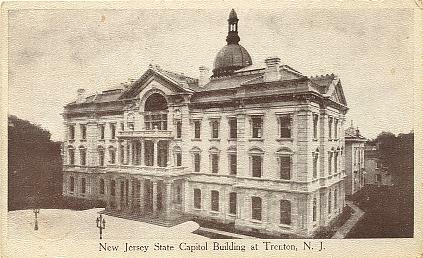 "New Jersey State Capitol Building at Trenton, N. J.". Sepia color printed postcard. Publisher not given. Unused. Probably circa late 1910s. 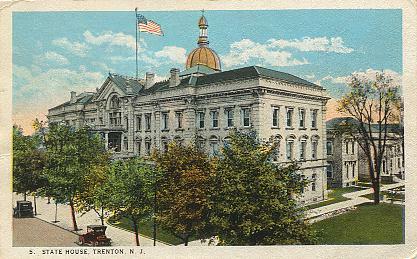 "State House, Trenton, N. J.". Color printed postcard. Published by the Sabold-Herb Co., Philadelphia, Pa. Number 5. Number R-91369. Postmarked 1924. 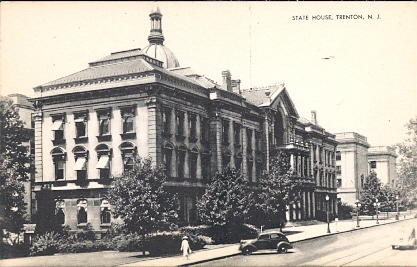 "State House, Trenton, N. J.". Black & white printed postcard. Published by the Mayrose Co., Linden, N. J. Unused. Probably circa 1930s. 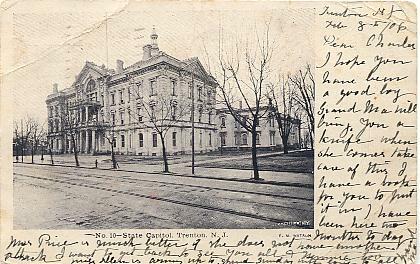 "State Capitol, Trenton, N. J.". Color linen-texture printed postcard. Published by Howard Johnson Publishing Department, Bedford, Pa. Printed by Tichnor Bros., Inc., Boston, Mass. Number 16. Postmarked 1952. 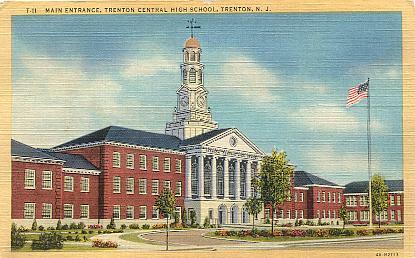 "Main entrance, Trenton Central High School, Trenton, N. J.". Color linen-texture printed postcard. Published by Lynn H. Boyer, Jr., Wildwood, N. J. "C.T. Art-Colortone" printed by Curteich, Chicago. Number T-11. Number 4A-H2113. Unused. Published 1934. 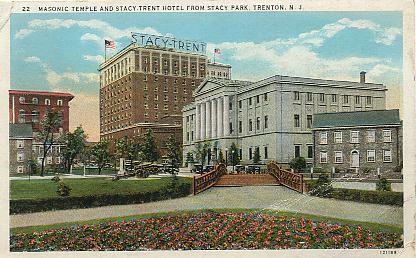 "Masonic Temple and Stacy Trent Hotel from Stacy Park, Trenton, N. J.". Color printed postcard. Published by Lynn H. Boyer, Jr., Wildwood, N. J. "C.T. Art-Colortone" printed by Curteich, Chicago. Number 121169. Number 22. Published 1928. Postmarked 1935. "Masonic Temple and Stacy Trent Hotel". Color linen-texture printed folder view. Published by Lynn H. Boyer, Jr., Wildwood, N. J. "C.T. Art-Colortone" printed by Curteich, Chicago. Number D-7121. Unused. Copyright 1943. 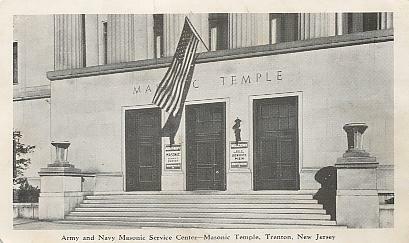 "Army and Navy Masonic Service Centre, Masonic Temple, Trenton, New Jersey". Black & white chrome-style printed postcard. Publisher not given. Unused. Probably circa 1940s. 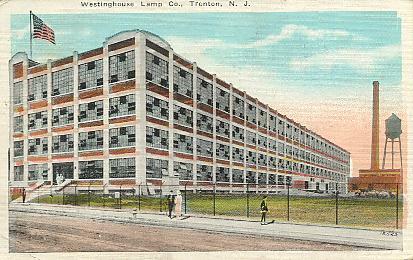 "Westinghouse Lamp Co., Trenton, N. J.". Color linen-texture printed postcard. Published by M. Number 12522. Postmarked 1937. 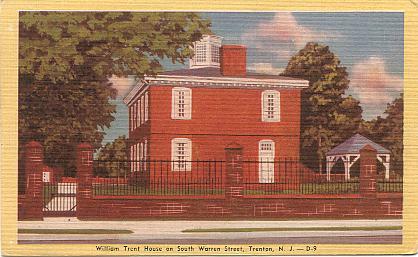 "William Trent House on South Warren Street, Trenton, N. J.". Color linen-texture printed postcard. Published by A. Berkowitz & Sons, Trenton, N. J. Printed by The Dexter Press, Pearl River, N. Y. Number 27907. Unused. Probably circa early 1940s. 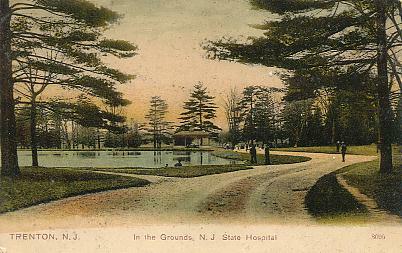 "In the grounds, N. J. 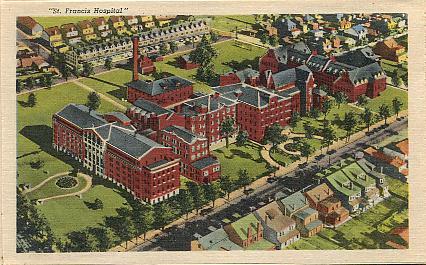 State Hospital, Trenton, N. J.". Color printed postcard; with undivided back. Published by Stoll Blank Book and Stationery Co., Trenton, N. J. Number 8095. Unused. Probably circa 1906. 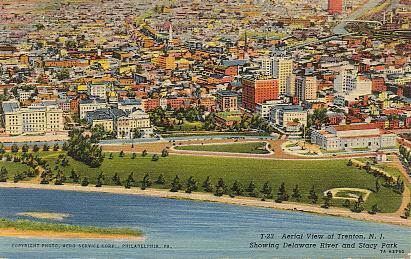 "Aerial view of Trenton, N. J. showing Delaware River and Stacy Park". Color linen-texture printed postcard. Published by Lynn H. Boyer, Wildwood, N. J. "C.T. Art-Colortone" printed by Curt Teich, Chicago. Number T-23. Number 7A-H3750. Unused. Published 1937. 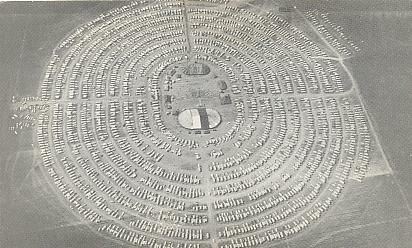 "The Raceway, Trenton, N. J.". Color printed postcard. Published by the Temme Co., Orange, N. J. Number 4026. Postmarked 1909. 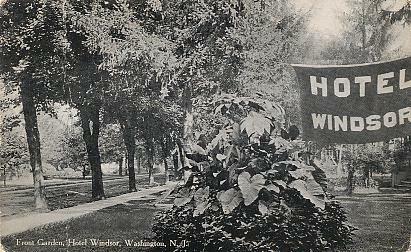 "Front Garden, Hotel Windsor, Washington, N. J.". Black & white printed postcard. Published by G. V. Millar & Co., Scranton, Pa. Number 11356. Postmarked 1912. 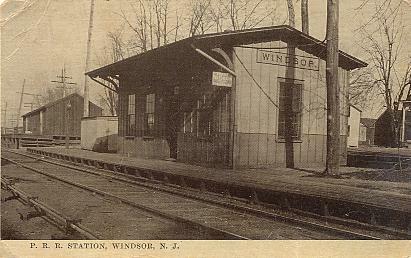 "P. R. R. Station, Windsor, N. J.". Sepia color printed postcard. Published by the Ess an Ess Photo Co., New York, N. Y. Postmarked 1913.